From this angle I can not tell whether this woman is a Luo or a Kikuyu. What I do know is that she is a Kenyan. The violence has continued despite Kibaki and Odinga agreeing to talk. It’s going to take more than an hand-shake to resolve the situation. The electoral crisis is no longer driving events which now center on horrifying revenge attacks directed at the Luo community in what were once quiet, cosmopolitan tourist towns. What can be done? Who can trust Kibaki or Odinga to heal these wounds when both blame each other for the violence? For each sees the chaos as a propaganda vehicle. Kenya needs fresh faces to form a platform on which the constitutional crisis can be addressed and the long hard work of repairing the country’s damaged institutions can begin. For too long the country has been run as the personal fiefdom of the elite. An equitable redistribution of land and resources must also be carried out; ethnic divisions would never erupt in a country in which all people felt they held a stake. Edit: On reflection, achieving such equity through redistribution is complicated and difficult. Focusing on economic growth and greater inclusion through extending employment opportunities is an urgent task. It is not going to happen. The global economy has been stitched up, Kenyan workers are similarly stitched up. Odinga could use the platform he has been given by the media to address these issues instead of harping on about the elections. What good are fresh elections now when people are dying? Kibaki might have shown himself to be singularly out of touch with what is happening but that should not prevent Odinga from taking the lead. Odinga might look more like a statesman if he were to spell out how these horrible wounds can be healed, instead of playing the blame-game and nursing his own hurt ego. Ninety people in all were killed over the weekend as the epicentre of violence shifted to Naivasha and Nakuru. In Nakuru, witnesses identified Mungiki sect members who they said were armed with guns and wore police uniforms. In yesterday’s incident only comparable to that visited on victims sheltering at an Eldoret Church early this month, charred remains of the 16 victims were crammed in a small, two-room house, where – according to witnesses – they had locked themselves up to escape the wrath of bloodthirsty youths. “When the attacks started, youths burnt the house, trapping them inside,” a resident said. Another four were hacked to death as they fled from the marauding gangs targeting members of one community. Others were killed and lynched after being fished out of public service vehicles on account of their tribe. Policemen watched the unfolding chaos helplessly as Nairobi was temporarily cut-off from western Kenya. 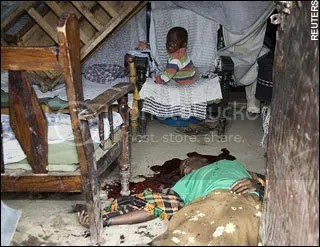 Independent reports put the death toll in Naivasha at more than 20, but police confirmed only 10. The number could be higher as several people were reported missing. In Nakuru, the death toll hit 60, with the number expected to rise as rival groups continued to clash. Witnesses said some of the attackers, believed to be members of the proscribed Mungiki sect, were armed with guns and wore police uniforms. Fifty-five bodies are lying at the Nakuru Municipal Mortuary with five more yet to be collected from the town’s estates. The mortuary, with a capacity of 42, was stretched to the limit as bodies streamed in. The number of those injured continued to rise and by yesterday evening, more than 100 victims were admitted to the Rift Valley Provincial General Hospital nursing arrow, cuts and bullet wounds. Burning of houses continued in various estates as hundreds continued to flee their homes. Police and military officers patrolled the town and suburbs as the violence entered its third day yesterday. Unconfirmed reports said a military chopper patrolling the town fired gunshots at Kwa Rhonda and Ng’ambo estates to scare away marauding youths torching houses. However, Nakuru deputy OCPD, Mr Mathew Gwiyo, said military officers fired shots in Bahati of Nakuru North District to disperse youths armed with pangas, bows and arrows who were torching houses. “The military choppers are assisting police with aerial surveillance and intervened when the situation got out of hand,” he said. At Sewage Estate, police had a hard time controlling two armed groups from rival communities and had to fire several times in the air to disperse them. Armed with pangas and other weapons, they mounted death traps at illegal roadblocks on the Nairobi-Nakuru highway, where they flushed out passengers from communities other than their own and lynched them. During the skirmishes, a prison warder accidentally shot his colleague, part of a team sent to quell the violence. Houses were torched and property worth millions of shillings looted during the chaos that turned Naivasha town into a no-go zone. In Kisumu today, young men blocked roads out of the town with burning tires and rocks. “Kikuyus must go!” “No Raila, no peace!” they yelled, referring to the tribe of Kibaki, and to his chief rival, opposition leader Raila Odinga. Members of Odinga’s Luo tribe are among those challenging the official election results, and in Kisumu some of them took out their rage on Kikuyus, including the bus driver who was burned to death. “The road is covered in blood. It’s chaos. Luos are hunting Kikuyus for revenge,” said Baraka Karama, a journalist for state broadcaster Kenya Television. Here is a report on how Luos in Limuru have been targeted by Kikuyu since Kikuyus were displaced in the Rift Valley. Many have fled to Limuru and are exacting revenge on Luos. TIGONI, 11 January 2008 (IRIN) – Susan Ouma sat on the wooden frame of her sofa, smiling down at her three-week-old daughter, Mary Akinyi, tightly wrapped in an orange blanket despite the blazing January sun. Ouma was clearly relieved to have found sanctuary after a week of terrifying attacks which forced her to sleep out in the fields where she had been picking tea leaves for Unilever’s Mabrook farm. Kenya Red Cross Society (KRCS) worker Zion Kibe Kangethe wrote down her details. The arrival of Ouma and her five children took the number of displaced people camping out behind Tigoni police station, 35km northwest of the Kenyan capital, Nairobi, to 400. “Numbers have gone down from earlier this week. We had 800 people. But we are still having new arrivals,” Kangethe said. Ouma explained why she had loaded all her possessions on to a donkey cart and travelled to this makeshift camp. “For the last week, a mob of young men have been coming to our houses. There were so many you couldn’t count them. They had machetes and they threw stones. They were smashing our houses. They came every night,” she said. Ouma, like many of the workers at the tea factory, is not from Tigoni, having moved from Siaya in western Kenya to find work. Ouma is a Luo, as is opposition leader Raila Odinga, while most people in Tigoni’s Central Province are Kikuyus, like President Mwai Kibaki. Conflict has broken out in many parts of Kenya since the announcement of disputed election results on 30 December, which saw the incumbent Kibaki return to power amid allegations of vote rigging. Thousands of Kikuyus fled Rift Valley Province after attacks by the dominant Kalenjin community. Many came to Central Province. This seems to have triggered off revenge attacks there by young Kikuyu men on perceived outsiders from the Luo, Luhya and Kalenjin ethnic groups. The field behind Tigoni police station is busy. Women and children cluster around; some eat plates of beans, cooked by local volunteers in giant saucepans. Others wash clothes in buckets or plait each other’s hair. Many just sit and stare numbly into the distance. Beatrice Chepkoech, a 20-year-old mother of three, was waiting to see a nurse from nearby Tigoni hospital who had set up a clinic under a tree. She held her nine-month-old baby, Samuel, who had developed a swelling on his head. Chepkoech is a Kalenjin from Eldoret in Rift Valley Province. She moved to the nearby town of Limuru last year where her husband found work in the Bata shoe factory. Tension started brewing in the lead-up to the elections. Chepkoech heard rumours that Luyhas and Luos would be chased out of Limuru if the opposition Orange Democratic Movement (ODM) won. The ODM did not win but violence erupted nonetheless. “On Sunday at about 6pm, a mob of young Kikuyu men came into people’s houses. There were about a hundred of them. They had machetes and clubs and were throwing stones and smashing the houses. They were chanting, ‘Those ones. Those ones. Chase them away’,” Chepkoech explained. Chepkoech spent two nights at the railway station before coming to the police station, where food, water, blankets and basic medical care were available. The KRCS erected three huge tents for the women and children, while the men slept outside. After a few days, Chepkoech returned home to pick up her possessions but her house had been looted. Her bed, mattress and blankets had been stolen. Only the sofa base, one jerry can and a few clothes remained. The family now want to move to Eldoret. “I don’t want to stay in Limuru. I’m scared the same thing will happen again. The children should be going back to school next week. We want to go home and take them to school there but we don’t have money for transport,” said Chepkoech. Chepkoech’s husband has found casual work in the Mabrook tea farm where he is paid about 50 shillings a day. With such a small income, it will be difficult to save the 2,500 shillings (US$37) they need to travel to Eldoret. Paul Otieno, 35, has a similar problem. He wants to return to Kisumu in western Kenya, with his wife and two children, but the garage where he worked as a mechanic has closed down since the elections. His employer, also a Luo, has moved to Kisumu. Otieno says he’s scared to even look for work in Nairobi, which also has a large Kikuyu population, because the people there are “very fierce”. About 100 people have become “night commuters”, continuing with their normal jobs during the day and then coming to sleep in the camp at night. A spokeswoman for the UN Children’s Fund (UNICEF), Sara Cameron, said this phenomenon was not unique to Tigoni. “In a situation that is far more reminiscent of northern Uganda than Kenya, many people in different parts of the country are going to police stations to sleep for the night, because they are afraid of attack,” she said. At Tigoni Police Station, everyone is waiting. A local Kikuyu businessman tours the field chatting to people. He has brought maize flour for the displaced. A local councillor, who refused to give her name “because they’ll slaughter me”, has also come to check on the relief operation. She believes that even if the displaced people do go to their places of origin, the problems will not end there. “What they are saying is they’ll go home and face any problems so long as they’re doing their own things without people from other communities going there for commercial reasons or whatever. This revenge is going in circles,” she said. There is also a good piece of writing on the origins of the land issue which is one of the problems underpinning the current crisis in Kenya here.